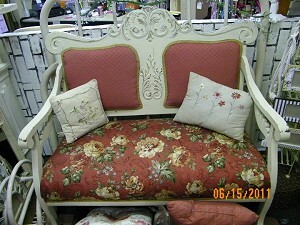 Welcome to Cottage Door Antiques & Gifts! Cottage Door Antiques & Gifts offers a unique shopping experience. A large variety of antiques, shabby chic, vintage, primitives, and retro furnishings, as well as collectibles and gifts, are available at the store. An assortment of vintage linens and quilts, glassware, lamps, and chandeliers are available. Vintage hats, clothing, children's clothing and nursery accessories can also be found at the shop. Vintage and fashion jewelry is one of the many highlights. If you are looking for a one-of-a-kind piece of jewelry, you are going to have a great time shopping for it at the Cottage Door. Designer and design-inspired purses, Knoxville Soap Factory soap, Warm Glow Candles and greeting cards are also featured. The shop has a great selection of seasonal décor featuring items from Ohio Wholesale, Raz, Creative Co-op, Colonial Tin and Door County Coffee; framed prints (some vintage); and CDs from the 60s and 70s . If you see something you like and want it customized for your home, we will be happy to give you an estimate and do the painting for you. When you find that special piece, you can hold it by using our 30-day layaway. All of your Favorite Things in a one-stop Shopping experience! Copyright © 2009, Cottage Door Antiques & Gifts. All Rights Reserved.